After a lonnnggg winter in the Northeast, even those not fans of baseball become happy at the first crack of the bat as that means Spring and warmer weather. 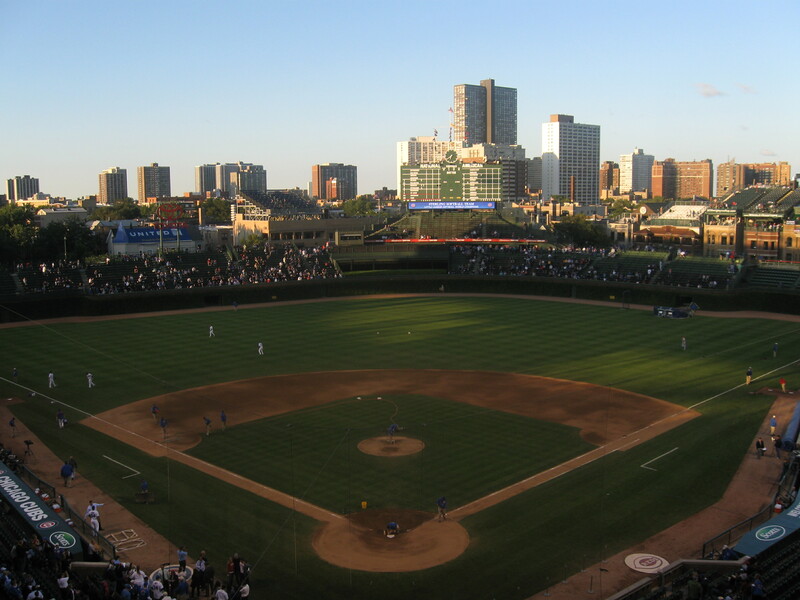 This year, there are no new Major League ballparks, but there are a few notable goings-on. The sacrilegious demolition of Wrigley Field continues as being a billionaire just isn’t enough for Tom Ricketts as he finds more revenue streams from the Cubs. That means ad boards! No longer will Wrigley be a complete step back in time as the place gets a makeover, including a video scoreboard. Of course, they’re making a mess out of the whole thing as the Bleachers are in shambles. Even the Cubs website is pathetic in their display of the whole thing. Restore means to “Bring Back”. Wrigley wasn’t exactly dead. Meanwhile, to someone who knows how to properly treat an old ballpark, Janet Marie Smith continues her work on Dodger Stadium and their gradual improvements seem to be for the good. Lastly, Cleveland copied the success seen at Coors Field last year by creating a social gathering bar-type section called The Corner. Expect more trends like this around the league as the sport tries to stay “hip” with the younger crowd and advertise the game as a hang-out. This new section at Progressive Field reduced capacity by about 6,000. In the minor-leagues, Nashville opens First Tennessee Park, at the site of the old Sulpher Dell ballpark. Not many tears were shed at the moving out of the 36-year old, vanilla Greer Stadium. The only signature piece fans wanted to see make the move was the guitar-shaped scoreboard, which is very cool. It will be interesting to see if this ballpark spurs other development in this downtown section of Nashville. Also in the PCL, the Oklahoma City franchise has been renamed the Dodgers. Boooo to that, I hate when a minor-league team loses it’s identity and character. Hope it’s not a trend as the same thing happened to South Bend. Down in the South, the Huntsville franchise moves to Biloxi, where the Shuckers will take the field as another clever Brandoise designed team. The Shuckers will have to start play their first few months on the road and still in Huntsville, as MGM Park will not be ready until (hopefully) early June. Not good planning by all involved as the city is on the hook for nearly a $1 million to expedite the process and $10,000 for every missed home game. Probably should have thought that through better. As for Joe Davis Stadium back in Huntsville, it unfortunately is slated to be demolished. In a piece of great news, the Brevard County Manatees once again will partake in the Jackie Robinson Celebration Game. This contest is held at Holman Stadium in Vero Beach (former Dodgertown) and with it becoming an annual event, we see that historic venue back on The List. In soccer, the lower divisions have resumed play this month and while the NASL sees little change (just the Jacksonville Armada join, making their home in the Baseball Grounds), big moves have been made in the third tier USL. I wrote about this last month and how much I hate it as the USL is evolving into a sort of MLS Reserve League. After LA Galaxy II played last year, there are now 8 MLS franchises that own an USL team playing in the same city. Most of these have some sort of symbol for “2” after their name, while only Salt Lake went with a different name (Real Monarchs, you know for all of that Spanish Royalty in Utah). Four of them play in MLS stadiums while the other four use a smaller facility within the region, none of which make The List. These are UBC Thunderbird Stadium (Whitecaps), Merlo Field (Timbers), Starfire Sports Stadium in Tukwila (Sounders) and the Ontario Soccer Centre in Vaughn (Toronto FC). Why I hate this trend is the ugly mix we now have between a reserve league with teams that have way different goals than the other independently run teams. Just make a stinking Division 4 and call it MLS Reserves. The USL did expand in other ways too as there are five new teams in cities that did not have professional soccer. Again, none of these independently make it on to The List and two of them are using baseball parks (Louisville and Tulsa). The Austin Aztex will set up shop in House Park, a downtown stadium that has been the center of High School Football for decades. It is in a cool spot for the trendy/hipster crowd that likely will take to soccer well. Colorado Springs will play in a refurbished Sand Creek Stadium, right across from Security Service Field. Lastly, St. Louis may correctly be thought of as a baseball town, but there is a deep history and passion for soccer (see the Women’s friendly last week). It’s good to see a team there and they will use Soccer Park in Fenton.